We provided to the Sant’Eufemia community a Rapid///CAST Streamer HD with automation system. 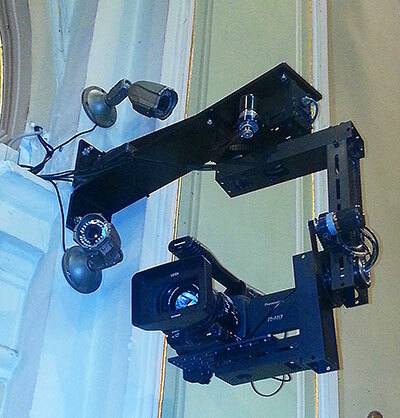 In the church we installed 5 Full-HD Panasonic Cameras: three of them are broadcast AJ-PX270E manually controlled by an operator, the fourth one is an AJ-PX270E mounted on a broadcast grade pan-tilt arm remotely controlled; the last one is an AW-HE120 used by the camera control unit of the Automation System. We also installed 5 HD-SDI screens inside the church to assist people who are not able to se the altar. The robotic pan-tilt arm allows the operator to perform very smooth shooting. The arm could support up to 15 kg and even a professional camera like the AJ-PX270 could be easy installed. The electronic control device of the arm is also interfaced to the camera (could be interfaced to any Panasonic Camera with remote zoom/focus input) and properly controls the zoom. The following video has been encoded and transmitted by our system at 400 Kbit/s. We installed a Rapid///CAST HD streamer with the HD camera bundle with two full-hd cameras and tools to manage presentations and live conferences or events inside an auditorium in Milan.